3-way Roundabout in Anacortes at Commercial Avenue and SR 20. WSDOT Photo. One of the classic games that I play with my family when I go to France is: where did they put in a new roundabout? To American drivers, Europe is known for its numerous roundabouts. The invention has revolutionized driving through intersections and has made improvements in all domains, including accidents, gas consumption, the numbers of cars that get through or even pedestrian friendliness. Roundabouts are part of the solution to America’s traffic violence problem as they reduce accidents by 40% and fatalities by a whooping 90% over 4-way stops or lights. Roundabouts make street crossing much safer for pedestrians in many ways. First, they split the crossing into two parts, already reducing crossing distance by half. They also eliminate the sometimes numerous turn lanes which can easily double the width of a street. This often leads to crossing distances being a forth shorter than previous intersections. They also make cyclist’s lives easier by making left turns from the right lane possible. Reaching left turn lanes on busy streets often require crossing two lanes of fast-moving traffic, a stressful experience for bikers. They provide more open space in the city, whether that would be used as green space or for public art. In Seattle, roundabouts would be a welcome sight to streets that have enough capacity for cars to use them but not enough capacity at intersections. They would improve dangerous intersections for all modes of traffic. They are also the only intersection system that works well with 5 (or more)-way feeder roads, which are especially numerous with Seattle’s colliding grids. 5-way roundabout at SR 542 and Smith Road, East of Bellingham. The Roundabout’s ability to deal with 5+ way traffic is well captured here. WSDOT photo. Marginal Way/Chelan Ave/Delridge St, at the west end of the West Seattle Bridge. This is a major intersection problem on the Alki bike trail. You can probably guess the degree to which I like talking to people. I love it. But we all have our quiet moments. There are certain cloudy days which have an indescribable air of melancholy. It’s almost comforting, walking under that grayish-white sky, green leaves and open roads in your periphery. I think it was a Sunday. No one in sight, and you’re ambling down a residential street. You feel that very specific sense of nostalgia which is both sad and oddly satisfying, walking around the white-gray-green world, looking at sidewalks and small trees. You see yourself as if from afar, ambling alone, letting yourself relax into completeness. Half your mind is in this zone of cloudy-day introspection, the other half self-aware, contemplating why and how this frame of mind surfaces. You are a character in a movie. A melancholy tune is playing. You put your hands in your pockets and walk like Gregory Peck, wishing the ground were metallic so your shoes could make those classy and authoritative clicking sounds with each step, but even if the ground were metal, you reflect your rubber-soled walking shoes wouldn’t make any sound anyway…. And there, before you know it, the nostalgic wholeness of being has vanished from you, fluttered away while you were thinking too much. It was in such a headspace that I once got on a 41 some time ago. I was dressed incognito, on a day off: black hoodie sized small, dark blue jeans, and scuffed dress shoes. Walking about downtown I inevitably run into people I know, or they into me. That’s magical, but today I wanted some solitude. As much as our culture celebrates the active over the passive, there is a benefit to taking time to ponder. Reflection doesn’t happen when you’re being distracted by new stimuli. One of the great preoccupations of the twenty-first century is the distracting of ourselves out of the present, usually with technology; this is why I won’t get a smartphone. I try not to retreat into the cozy confines of diversion, that addictive place where I don’t have to confront my own thoughts. Let me rather take the dive, that I might feel something real. I sat down next to an African man, first generation, neatly shaved and dressed. Leaning back into the seat, I enjoyed that wonderful sensation I imagine many operators feel when they board a bus they’re not driving– the bus is moving, but I’m not responsible! “Hey! You recognized me!” I said, with pleasure. Must be a passenger I didn’t remember. His gentle smile brought me right back to the excitement of hearing from others. How was his day going? How did he recognize me, though I was in my elaborate Nathan disguise? He responded by describing how memorable it is when I’m driving, and how could he forget such an experience? Naw, I said, trying not to blush. Yes, he replied, laughing. Don’t be silly! He expressed his appreciation for how I announce all the stops, how I’m patient with people, answering questions and the rest, but most of all he appreciated that I was kind to immigrants. It’s a big deal, he stressed, for people who are new here, because it’s hard to get around, confusing, and sometimes you need someone who won’t judge you, who will give you a few extra moments, as it can make all the difference in the world in feeling welcomed. His name was Mesfin. Language is important, we agreed, noting our shared multilingualism and the value of such, how it expands one’s perceptions of ideas and people. I mentioned a friend of mine, Abiyu, also from Ethiopia, and how his three young sons were already studying their native language as well as English, French and Spanish. “Does he live in Bellevue?” Mesfin asked. “Oh my goodness!” Who could’ve guessed we had a mutual friend? Abiyu is one of the great bus drivers, in my opinion, one of those men you find in life whose every word you hang onto, because you know he thinks before he speaks. The quiet voice, eyes twinkling with verve and wisdom. “Yes, language is important,” Mesfin said. At this point he began telling me a story, and the longer he spoke, the more rapt with attention I grew. In the mornings Mesfin would rise early and walk alone on the dirt path to a nearby bridge. This bridge was special, because from it you could see the most spectacular sunrises. Never anyone else around. When you’re raising a family, time alone gains a different and specific value. Watching the predawn light come to blazing life was Mesfin’s way of carving out space for himself. I looked at the man in the seat next to me, struck like a thunderbolt by how little of this world I know. I was looking upon the same being who one morning wasn’t sure if he had seconds or minutes to live, couldn’t be sure if his family would ever know him again. “Yeah, it’s important,” he said. Last month, in Moustiers Sainte Marie, France, I watched several shopkeepers return a lost young bird to a part of town closer to its natural habitat. This small drama was a play of few acts, but reflected a pattern of human conduct embedded in urban life. I was well-positioned to capture the moment with a Fuji XT1 camera, and was immediately reminded that the complex issues of wildlife in the cityare often first framed by common sense, ingrained patterns — a “let the bird go moment” — readily captured by watchful eyes. I’ve made little secret in past writing of my strong belief that these simple, underlying patterns merit repeated attention and illustration as we attempt to set up best practices in the urban environment. Best practices often begin as first principles worth capturing, but the question remains how to recognize such “teaching moments” for use going forward. I suggest that in many instances, these moments are obvious to the beholder, andessential to record and later evoke for illustration and discussion. How we should capture such first principle, “teaching moments”? What tools should we use? What are the secrets of documenting compelling examples for posterity’s sake? Below, I describe how to capture common sense portraits of the urban environments for later use, and why. Early Saturday morning I had the opportunity to participate in a simulation of bus and light rail service in the Downtown Seattle Transit Tunnel (DSTT). The DSTT is unique among transit systems, with both buses and trains sharing the roadway and stopping at the same platforms. With the tunnel already facing mass-transit congestion (a good problem to have), the simulation tested if the tunnel could support increased capacity. The tunnel was conceived in the early 1980s as as a solution to buses’ sluggish travel times between the north and south ends of downtown. Construction of the 1.3 mile project took three years and cost $455 million. Five stations, each with a unique design and adorned with colorful art, make up the DSTT: Convention Place, Westlake Center, University Street, Pioneer Square, and International District. Between each station are pairs of 18-feet diameter tubes. Service officially began in September 1990 with dual-mode buses that switched to overhead electric power when entering the tunnel. The tunnel closed 15 years later for a two-year retrofit that included replacing the original unused rails, lowering the roadway to facilitate level boarding, and constructing a stub tunnel where trains could reverse direction. The tunnel reopened in September 2007 with hybrid buses, and Link light rail began operating between Westlake Center and Sea-Tac Airport in July 2009. 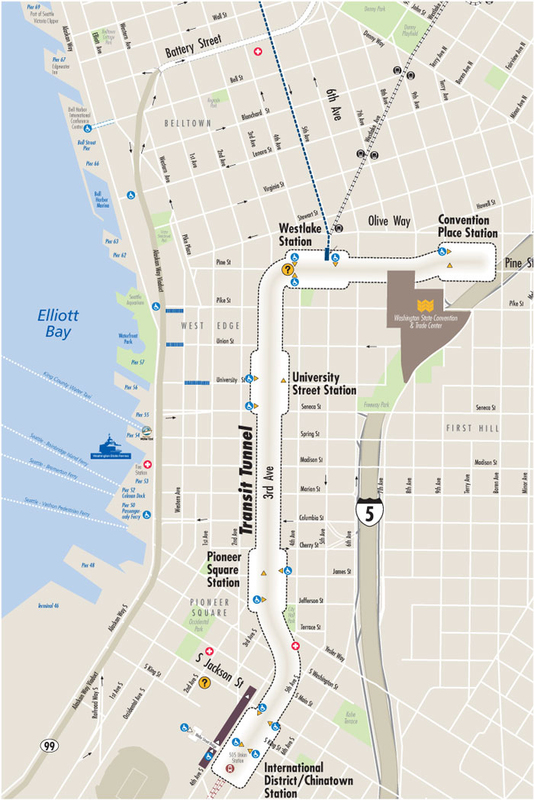 In 2016 Link is expected to begin extended service from downtown to Capitol Hill and the University of Washington’s Medical Center and Husky Stadium. The latter neighborhood is second only to downtown as a regional transit destination, so frequency of service during peak hours (currently 6am-8:30 and 3pm-6:30) will be increased to every 6 minutes (up from 7.5 minutes currently). This will exacerbate the current conflicts between buses and trains; buses are not allowed to proceed when the tunnel between stations or station platform ahead of them are occupied by a train. Saturday’s simulation tested whether buses can be efficiently run between trains. Volunteers from several transit agencies staffed each station to act as timers and data collectors. I was positioned at the southbound platform of University Street to note the exact time each bus and train entered the station. Over the course of four hours the trains did run roughly every six minutes, and there were frequencies of 40, 45, and 50 buses per hour. I found that the buses tended to travel in groups of two, three, or four, with an average of six buses running between trains. Bus operators were held at their stops for seemingly random periods of time, ranging from 10-90 seconds, to simulate passenger pickup and dropoff and the associated delays with fare payment, wheelchair loading, and crush loads. From my perspective as a frequent user of the tunnel (and from talking with Metro employees), the simulation went smoothly. However, it’s still possible that without actual passengers and operating routes the simulation could not accurately reflect the actual congestion that may occur. A post at Seattle Transit Blog goes over potential changes to the system. Based on my experience today, I also have several suggestions for improving operations. Firstly, I noticed there is a 15 second buffer between a train exiting the station and a following bus (or vice versa) entering the station. Unless there is a regulation on this, the buffer could essentially be reduced to zero to speed things up; in other words, the bus/train could enter the station as soon as the leading train/bus leaves. The stations are at least 350 feet long and provide an ample safety distance. Related to this, buses are apparently not allowed to enter the tubes between stations if a train is in it (indicated by the red/green traffic lights at tube entrances). This is an even larger cause for delay, since the tube segments are much longer than the stations. Buses should be allowed the enter the tubes immediately and stop a reasonable distance behind any waiting trains at the next station. Additionally, buses should be allowed to maneuver through the center lane if the bus ahead is delayed; currently this lane is wasted space. Another ongoing issue is the “bays” at each station. Each northbound and southbound platform consists of two bays, lettered A through D, where buses are supposed to actually stop. Almost all of the bus routes are designated at bays A and C (the “front” of north/south platforms), with only a few at B and D. This results in overcrowding at one area of each platform. This also causes multiple bay A and C buses to line up, with waiting passengers having to choose between two risks. If their bus is second, third, or even fourth in line, they could try waiting at the designated spot and hope the driver stops again at the front of the platform. Or, they can try walking down one or two bus lengths and risk being left behind when the bus gets a chance to move up before they get there. A potential solution is to create additional bays for spacing out stopped buses. During peak hours, before entering the tunnel buses could line up in the order of their designated bays, ensuring predictability for passengers. Redundancy would be minimized because there are spaces for at least six articulated buses along each platform. Alternatively, each bay could have a digital sign that indicates which bus will stop there several minutes ahead of time, based on what order buses entered the tunnel. That would present similar technical challenges that face underground OneBusAway signage and have delayed cell phone coverage in the tunnel, where all of these features are needed most. This will all be a moot point if buses are removed from the the tunnel, which is a possibility if a train turn-around is built near the International District station in 2019. And while the simulation showed the potential of improved collaboration between Sound Transit and Metro, only actual operations will show if they can provide the best possible service to downtown (not considering incoming service cuts). As light rail builds out and Seattle grows it will be essential to continue integrating the region’s transit systems. Scott is a graduate student at The University of Washington’s Department of Urban Design and Planning. This post was originally published at his personal blog, The Northwest Urbanist. Courtesy of a Harvard Study on paid leave. The average amount of paid leave for all working adults is 12 days plus 8 public holidays. This means the average American has the same amount of leave as the minimum required in many other countries. Additionally, nearly a quarter of Americans have no paid leave or holidays. This burden falls disproportionately on those that make less money. Only about one-third of part time works have paid leave and only two-thirds of hourly workers making less than $15/hr have paid leave. The arguments against minimum vacation requirements are almost exactly the same as the arguments against paid sick leave and ultimately fall flat. Most of the criticisms of the paid sick leave ordinance revolved around increased business costs. As an example, John Schmidt who owns a few restaurants in Seattle (Eastlake Bar & Grill, Greenlake Bar & Grill, Lunchbox Laboratory) claimed that the paid sick leave law would increase his costs by $1,000 per employee. This opposition was somewhat predictable, coming from the Greater Seattle Chamber of Commerce and other business interest groups. To the credit of Seattle business owners, nearly 70% supported the law in a follow up study. Furthermore, these dire costs didn’t pan out. The worst thing that can be said of the law is that some business may have raised some of their prices a little. This evidence comes from an industry back study and is hardly an apocalyptic outcome and might not be true. If it is true though, it’s likely that passing on cost to consumers in order to benefit low wage works is exactly the progressive outcome Seattlites wanted. It is unlikely that the affects of a minimum paid leave law would be any different than paid sick leave. It seems like Seattle has all the right prerequisites to pass a minimum vacation ordinance. After recently passing minimum wage and paid sick leave laws, there are established grassroots organizations and politicians that would be natural allies to this cause. Additionally, this would improve the working conditions for many people in the city. Lastly, like the minimum wage law, this would set a precedent for the nation and could be a jumping off point for a national campaign. If you agree with this you can contact city council and tell them you support a minimum paid leave law. Council Member Sawant might be the most receptive. Also if you agree that Seattle should have a minimum vacation requirement, we encourage you to support a national minimum. Would you believe it? A Seattle designer created this amazing utility bike that has garnered national attention and was selected as the best utility bike design. Take that, Portland! Elysian Brewing Company by angela n. on Flickr. Stay away: The Downtown Seattle Transit Tunnel is closed today. Social welfare reform: There’s a battle brewing over public housing policy and practices in Seattle. The mayor and the Seattle Housing Authority are odds. Share the road: Maybe the mantra isn’t one that we should be touting. In the dust bin: California has tossed away the old delay metric in Level of Service (LOS) analysis–too bad cars! Closed: The Battery Street Tunnel will be closed later this month for 4 days, so watch out drivers! The Denny: A new urban bike has been crowned king, and it’s Seattle-based. Judgemental maps: It’s fun to be a jerk sometimes, and these mapheads have done a fine job at that. Real ridesharing: It only took a few years for Lyft and Uber to decide that actual ridesharing would be a good idea. Free ORCA pass: If you live north of 85th Street, you could get free rides and a free ORCA pass. Parking design: Yeah, that doesn’t seem right, but this woman has worked to make parking lots a whole lot better. Parking costs: We’ve said it a lot, parking adds cost to housing, which reduces affordability; the rules are outdated. Phasing plan: There’s a good phasing plan for real highspeed rail in the US. No more roads: Missouri voters turned down a horrendous roads tax. Carbon tax: Voters are beginning to feel a lot better about a carbon tax. Family-friendly Vancouver: The story of how Vancouver, British Columbia became on of the most family-friendly urban places in North America. Pricing caps: France is toying with the idea of putting pricing caps on housing, but will it work? Unincorporated cycletrack: King County is wading into uncharted territory with a cycletrack to connect two trails in the rural east county! Bertha bust: The New York Times highlights our failed tunnel effort, and reminds of how screwed up the fix-it solution is. A conundrum: Many renters could get a mortgage, but they just can’t afford a home. Cycling and wealth: The data surrounding cycling rates and income are very interesting, and maybe what you expect. Parks won: In case you missed it, we had a vote on a Metropolitan Park District, and the parks won! Trulia’s blog provides another important contribution about housing costs. The most recent post includes the graph above. This graph reinforces the evidence that the price of housing is largely determined by the need for housing and the amount available. You might remember previous graphs they’ve produced showing the connection between costs and units built or between costs and permits approved. Trulia’s graph doesn’t look at the actual number of units built, but it does make an important point about population growth. Frequently people make the mistake of thinking that the number of people moving to an area is the same as the number of people who wish to live in that area. A common erroneous assumption is a nearly 1:1 relationship between units built and new residents. Unfortunately, cities don’t work like that. Instead, most growing areas would likely grow faster if they had more housing, indicating that there are people who would like to live there but can’t. In other words, it’s hard to figure out what the need for housing actually is. Trulia tries to solve this problem by understanding why people move in the first place. In other words, if there are job opportunities in an area, it’s likely that people will move there, especially in an economy with high unemployment. This assumption is reinforced by other research. The Census Bureau acknowledges that a big reason for moving to a new area is employment. The Census Bureau regularly examines why people move. The reasons break into basically 3 categories: housing, relationships, and jobs (as seen in the graph to the left). While housing reasons make up more than 48% of the total moves, housing is likely a small motivator for moves to new metropolitan regions. In other words, people may move for better housing, but this doesn’t necessarily change the need for housing in a region if they already lived in that region. To illustrate which moves change how much housing is needed and why those people move, the Census Bureau breaks down moves by distance and reason. Meanwhile, in the table below, it is quite evident that housing disproportionately motivates the reason for intracounty moves and more than half of the moves of less than 50 miles. In other words, moving for better housing, is the biggest reason people move, but it doesn’t change how much housing is needed. As moves increase in distance, the motivation for moving changes significantly. Jobs and family motivate over 60% of the other moves and account for as much as 78% of moves over 500 miles.